• Upon approval from the Legislature, proponents must submit a concept for design, dimensions and location. • The Governmental Mall Commission, Arizona Department of Administration and Historical Advisory Commission must approve the final design, dimensions, location and maintenance requirement. • Memorials and monuments must be completed and dedicated within two years after the effective date of legislative authorization. • Before construction begins, an amount equal to at least 10 percent of the artistic design and construction costs must to go to a fund used to repair and maintain memorials. 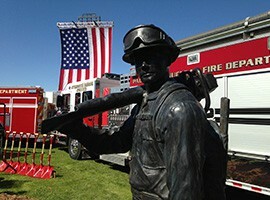 At the groundbreaking Friday for a memorial honoring firefighters killed in the line of duty, Gov. Doug Ducey said firefighters should be honored in every way possible. The monument will be outside the State Capitol building in Wesley Bolin Memorial Plaza, near memorials to 9/11 and World War II. “Arizonans will be reminded of their sacrifice and valor every time they come to the Capitol,” Ducey said. According to the Arizona Fallen Firefighters and Emergency Paramedics Memorial Commission, more than 105 firefighters have fallen in the line of duty in Arizona since 1902. They include 11 firefighters from the Kingman Fire Department who died in a single explosion, six from the Arizona State Land Department Fire Management Division who fell battling a massive wildfire in 1990 and 19 members of the Prescott Granite Mountain Hotshots who lost their lives in the Yarnell Fire in 2013. “Our purpose is not to mourn, but to remember,” said Rick DeGraw, chairman of the memorial’s commission. DeGraw said the memorial will include 10 life-size bronze sculptures of firefighters and paramedics, sculpted by Rep. Rusty Bowers, R-Mesa, and Paul Olesniewicz, a retired Tucson firefighter. 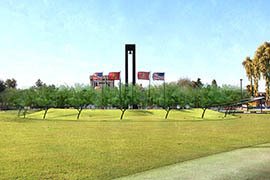 The memorial commission’s plans also include a bell tower and removable seating for 400 people. DeGraw said the commission has about $350,000 more to raise to complete funding for the memorial. He said 70 corporate entities have already donated close to $1 million, while citizens gave $100,000 in small contributions and the construction industry contributed $175,000 in in-kind contributions. “This effort touches all of Arizona,” DeGraw said. 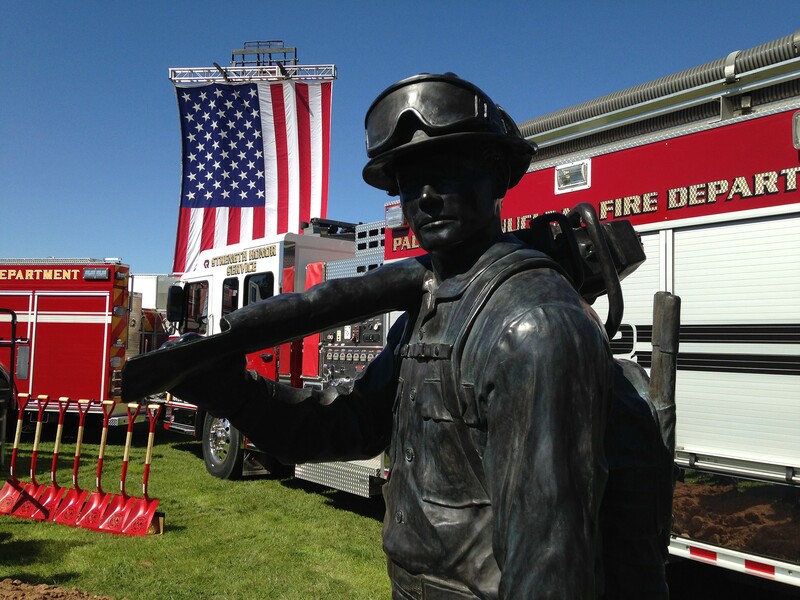 According to the National Fallen Firefighters Foundation, Arizona is one of only a few states that don’t have a statewide memorial for fallen firefighters. Brian Jeffries, president of the Professional Fire Fighters of Arizona, said the memorial will be a place where people can reflect and remember the firefighters who lost their lives. “This spot is going to be a new home, because here in Arizona we’re going to have a piece of ground and wonderful tributes, not only for our firefighters and our paramedics and all of our emergency responders, but for their families,” he said. 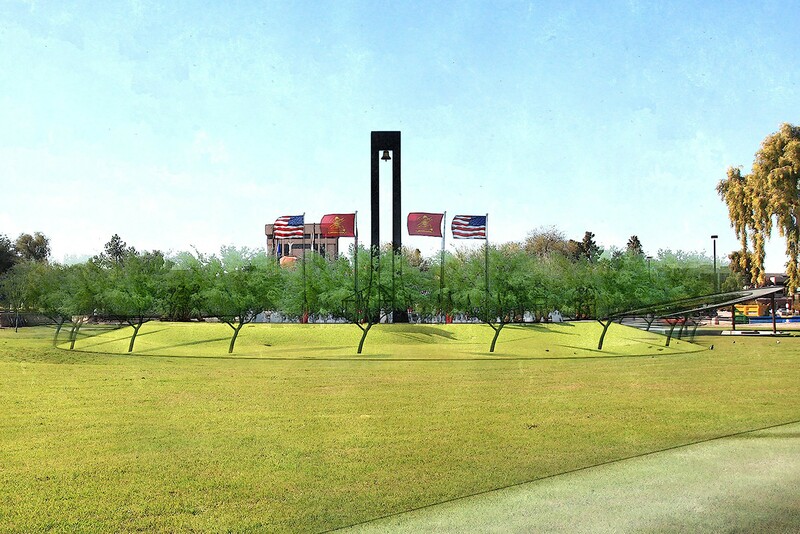 A memorial being constructed outside the State Capitol to honor fallen firefighters will include a bell tower, 10 statutes and removable seating for 400. 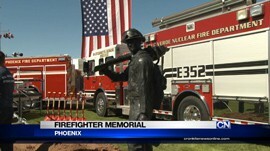 An artist’s rendering of a monument honoring firefighters killed in the line of duty. Gov. Doug Ducey was among those who attended a groundbreaking for the monument on Friday. One of the statues that will anchor a memorial outside the State Capitol to Arizona firefighters killed in the line of duty.